How eCommerce Social Login Services can change the face of your online business? 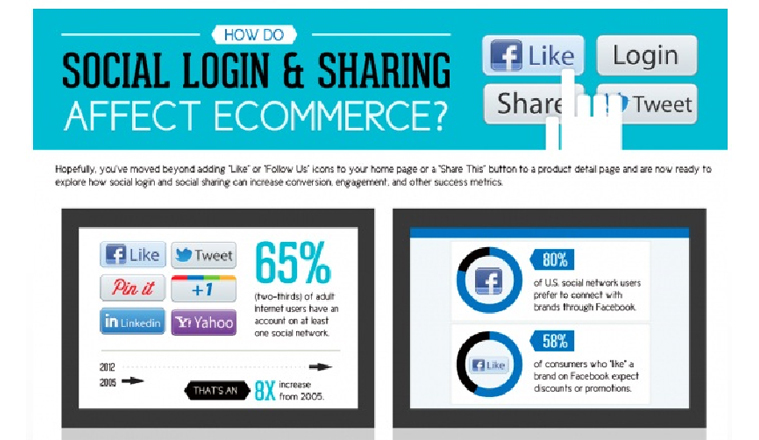 Social login options influences the business of online stores to a great extent. The social media is traversing new horizons and has transformed from the earlier social networking platform into a more business focused platform that could shape the business growth of your company in the long run. It provide businesses a medium to connect with their targeted customers instantly for increasing their brand value and chances of business growth. Moreover, with a combined customer base of more than a billion users around the world, social sites like Facebook, Twitter, Google+, Linked in and such others are providing unmatched business opportunities. You can’t ignore the potential of social media when you are facing a tough competition and the consumer mindsets are unpredictable in nature. You can understand the ever growing influence of social media in this way that almost every other site consist of various social media icons that are displayed at an appropriate position for getting maximum customer attention. E-Commerce social login is not a recent trend and has been in practice for a significant amount of time due to their ability to grab maximum conversions and product sales. This is one of the most important areas that can’t be ignored at all and Velocity has emerged at the forefront for delivering its out- of- the- box services to its clients. You need to understand how the use of social media can transform your eCommerce store into an “all- together different ball game” with the help of various functionalities that are mentioned below. Today in this era of affordable smart phones and improved data services, almost every other individual is engaged in one or the other social sites. Due to this social engagement of your business, more number of people are informed about your brand which improves your chances of business acceptance and growth. This is where our eCommerce social login services comes into play. Additionally, with higher number of customer engagement, there are increased chances of making product sales, conversion rates and high online visibility among your rivals. By persuading customers to login through various popular social media sites, it will be much easier for you to have more customer registrations on your site. It is a common known fact that customers are not ready to share their personal details and credentials for the purpose of account login. You need to utilize eCommerce social login options on your online store that could tempt customers to login on their social sites in lieu of browsing their social media accounts in a seamless manner. The huge user base of social media sites is a treat for eCommerce stores as they provide an option to increase their sales and conversion rates. With the eCommerce social login services of Velocity, our social media marketing experts can help in increasing the sales of your products by creating required hype and awareness among your customers. It also provides your customers a chance to share and promote your products through social media features like “Like”, “Share”, “Retweet” and other such options. Don’t under- estimate the power of social media for scripting new territories of growth and conversions among your business rivals. E-Commerce social login can create a big difference in this direction if you are capable to utilize them effectively on your site. “Go social, think global” is the present business mantra for numerous eCommerce sites and it is time to lap up this opportunity for your online business.